Heesen’s much anticipated 50m Fast-Displacement build known as Project Nova has officially launched at the shipyard in Oss and is now known as M/Y Home. Home represents yet another build utilizing the popular fast-displacement hull form designed by Van Oossanen Naval Architects. She is also the first fast-displacement superyacht to incorporate hybrid propulsion into her design. The two propulsion options include diesel mechanical and diesel electrical. Home is equipped with DC powered electric shaft motors (each 127kW) capable of silently cruising the yacht at 9 knots running only the generators. 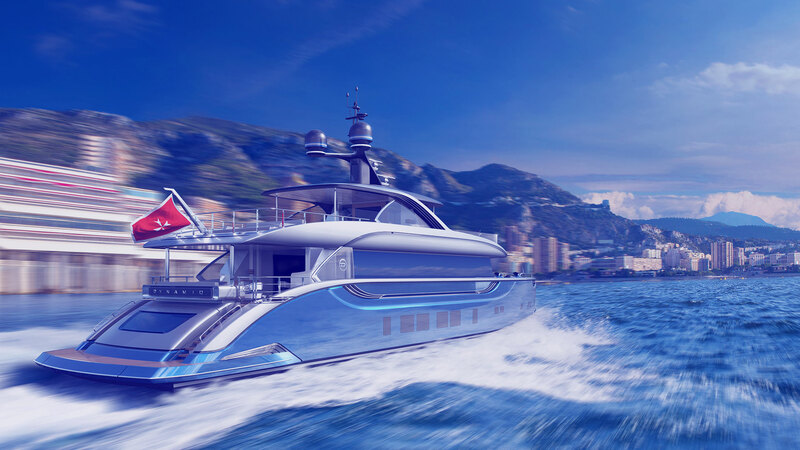 Built in all-aluminum Home comes in at just under 500 gross tons with a draft of 2.15 meters ensuring effective cruising of shallow areas such as the Bahamas and other tropical destinations inaccessible to larger superyachts. Thanks to the hybrid propulsion systems and fast-displacement hull form Home has a transatlantic range of 3,750 nautical miles at a cruising speed of 12 knots with a top speed just over 16 knots. Omega Architects penned the powerful and aggressive exterior styling that incorporates a vertical bow for less vertical acceleration and a more comfortable ride. Cristiano Gatto Design created an interior that matches the lifestyle of Home’s owners and seamlessly blends the interior and exterior living areas. This effect is amplified by the massive, full-height windows throughout the yacht. The interior was designed based on a two-tone palette creating a relaxed and bright atmosphere throughout the luxurious six stateroom layout. Freestanding furniture abounds and items such as the dining tables and bars have been custom designed by Cristiano Gatto and built by Heesen’s expert team of carpenters. Additional amenities include a superyacht gymnasium and spa on the lower deck with a jacuzzi on the flybridge for guests to soak in the view underway or while enjoying themselves at anchor. M/Y Home represents a new era of cleaner and more fuel efficient yachts for Heesen and following her launch she will remain at Oss to undergo commissioning.